All of you readers were clamoring for photos of a cyclist in a skirt. Never let it be said that we don’t listen to our readers requests. Don Walker is also the organizer of the North American Handmade Bicycle Show. The fourth annual show begins in Portland, Oregon on February 8 at the Oregon Convention Center. Nearly 200 exhibitors are signed up for the 2008 show, which is expected to feature lots of commuter and utility bike goodness this year. The bike I mean. Yeah, the bike. Not exactly what we were clamoring for, but hey — you can’t please everyone! That is a mighty fine looking bicycle. I wonder why you are so advanced regarding craftmanship in the US- here in Europe you can hardly find welders for doing prototypes. It is the lower taxes? If he can actually ride that in a kilt I’d be bloody well amazed. That’s no ordinary kilt. It’s a shilt. Part short, part kilt, and bicycle specific. There is no chamois required either, since the 3 yards of wool provides more than enough padding for even the most sensitive rider. Right… and you are so full of shilt. sheep can hear a zipper at a thousand yards. 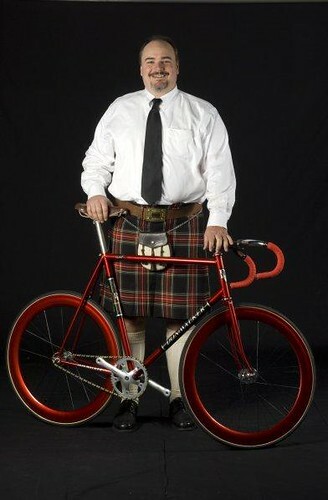 Seriously, how does one ride in a kilt without encountering modesty issues?